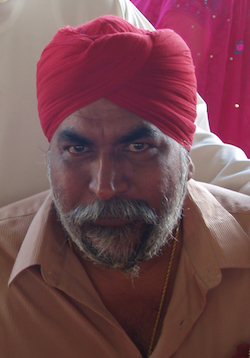 Jasbir Singh Jessy: Returns as Gurdwara Sahib Kampung Pandan Settlement gurdwara management committee (GMC) president. Jasbir Singh Jessy will head the Gurdwara Sahib Kampung Pandan Settlement gurdwara management committee (GMC) for the next two years. The former committee president makes a comeback when he gained 98 votes against out-going GMC president Aphtar Singh who garnered 18 votes at its biennial general meeting (BGM) yesterday (20 March 2016). “Our main priority moving forward is to build the new gurdwara building,” Jasbir tells Asia Samachar. Jasbir had served as the GMC president earlier for 10 years between 2003 and 2013. When asked why he contested when he had earlier told Asia Samachar that he would be making way after serving a two-year term, Aphtar said it was upon the request of a segment of the gurdwara members. See here. The gurdwara, located a mere two kilometres from Wadda Gurdwara Sahib Kampung Pandan and about 10km from Gurdwara Sahib Sungai Besi, is moving into high gear to build its new building. Bhenji Anita, if that is true, the sanggat should not accept such a person as a Leader. Gurdwara parbandhaks should by knowledgeable about Gurmat principles and uphold the same. I wonder whether it is worth commenting or providing views when those involved and are subject of comments do not even response. SILENCE IS NOT GOLDEN AND REMAINING SILENT WILL ONLY RESULT IN PERCEPTION THAT THOSE INVOLVED COULD NOT CARE ABOUT THE VIEWS/SUGGESTIONS. IF SANGGAT REMAINS QUIET AND SILENT AND NOT GET INVOLVED THEN THEY DESERVE THE LEADERS IT GETS AND THUS NONE SHOULD COMPLAIN ON HOW THE MANAGEMENTS OPERATE GURDWARAS OR NGOs. Very well said just building big gurdwaras is not enough but to educate sikh sangat and have more guru di sangat is gr8 deal…. While everyone is busy building bigger, higher, fancier and more expensive Gurdwaras, we have somehow forgotten that we also need to make Sikhs of ourselves and our children…let there be a balance…our children are getting more and more disillusioned with the disparity between our teachings and our practices. out-going GMC president Aphtar Singh who garnered 18 votes at its biennial general meeting (BGM) yesterday. I thought Sr Aphtar Singh had said he would not be standing for the elections. So how did he get 18 votes. Hope the new Committee will reconsider the proposal of a new building especially when there is a large Gurdwara only 2km away. My views on new/redevelopment/expansion of buildings have been given in my earlier comments available on the AsiaSamachar.